Ruby valley trekking is located between Manaslu Conservation Area and Langtang National Park, along with the great combination and varieties of tallest Mountain Ganesh Himal I (7,429m. ), Ganesh Himal II (7,118m. ), III(7,110m. ), IV(7,052m. ), V(6,986m. ), VII(6,350m. ), Manaslu (8,163m. ), Lamjung Himal (6,800m. ), and Langtang Lirung (7,300m.). 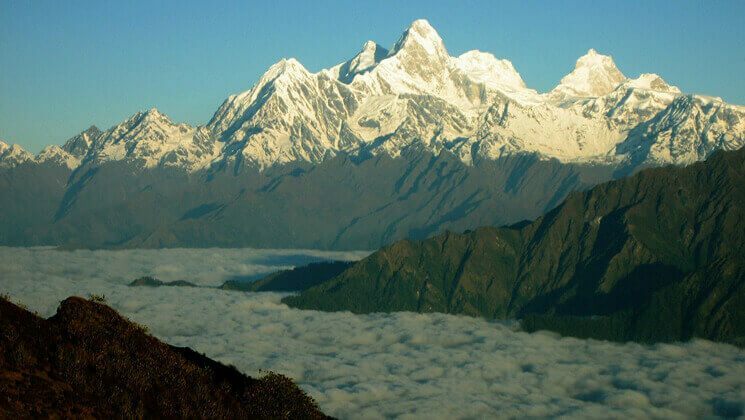 Not only the Himalayan scenery but also you see Buddhist monasteries, different species of herbal plants, beautiful landscapes, ruby crystal, zinc mining, different species of birds, different wild animals such as barking deer, Ghoral, Thar, Red pandas, Tiger, Bear, snow leopard, wolf, various kinds of monkeys and musk deer. Furthermore, trek to Ruby Valley, you can pass twin cascades Ganga and Jamuna which makes your spirit delight. March to May are the best months to discover this route as the trail has colorful rhododendron and other nice blooming flowers. Ruby Valley is also a part of Ganesh Mountain and treks over Pangsang la pass offers an excellent view of brilliant landscapes and farm terraces. As you trek to ruby valley, you can experience the best passing through several villages of diverse ethnic people including Tamang, Chhetri, Gurung and observe their culture and lifestyles. As Ruby valley treks are new published trek route there are still no lodges, not basic infrastructure, so you stay overnights either in normal houses or in Tented accommodation. Pangsang Pass La pass combine with ruby valley trek route is designed for world travelers who wish to hike but are walking within a more relaxed manner than take a look at this itinerary. However, if this itinerary doesn’t suit you then request us for a tailor-made itinerary. Day 02 Kathmandu city tour ! World Heritage sites (1348m) sightseeing, 6 hours. All aspects of gear and conditions are discussed to make sure you’re fully prepared for the trip, and any last minute questions answered. After lunch, we explore this medieval capital city Kathmandu. We visit Boudhanath, also known as Little Tibet. Then we visit Pashupatinath, holy temple of Hindu where cremation takes place by the holy river Bagmati. Later we visit Kathmandu Durbar Square and Syambhunath Stupa. And transfer to hotel. Taking local bus early in the morning or a private four-wheel drive journey from Kathmandu reaches Shyabru Besi, gateway to the Langtang Valley at the confluence of the Bhote Kosi and Langtang Rivers. Mesmerizing scenic driving and passing through Trisuli Bazaar, Ramche Gaon and Dhunche Bazaar make you full of fun driving. Narrow and bit adventurous rough road but amazing landscape along the way driving will make you good start day drive of the trek. The zig-zags trail goes west up to Bahun Danda Pass and then down to the Tamang settlement of Gatlang, a cornerstone village on the Tamang Heritage Trail or hike to Gatlang by way of Chawatar. Gatlang is a Tamang village with unique customs are famous for craftsmanship setting. Above lies Parvati Kund, popular during Janai Purnima when thousands of pilgrims are attracted to the sacred pond and nearby temple. The trail ascends through pine and rhododendron forest to a lunch point of Yuri Kharka before continuing to Khurphu Bhanjyang and then dropping down to the Somdang River, border between Rasuwa and Dhading districts. A sprawling mining compound, no longer functioning but seem locals appealing government to revive it, lies a few hours to the north upriver. The hike passes through a scenic valley featuring the 200 m Chukarma Waterfall. The former mine leaves a lot be explored and is the site of a 1.4 km tunnel bored into the mountain to extract zinc, copper, tin, crystal and even highly-prized rubies. This day, you hike to Lari mine Company. We may enjoy the view of Paldor peak and other Mountain View and overnight at same place. Pangsang Kharka is a viewpoint southwest of Somdang village with a broad panorama of the surrounding terrain. In the north the soaring Manaslu and Ganesh Himal Range are breathtaking. The whole Ganesh Himal region is blessed with abundant herbal plants. Previously, herbs were taken to Tibet along an ancient trade route and exchanged for salt, livestock, wool, and turquoise. Pangsang la pass offers Langtang range, Ganesh Himal ranges, Manaslu ranges and few Annapurna ranges within 270 degrees. Descend to Tipling, a large village that hosts two Buddhist gompas and both a Protestant and Catholic church. Along with a ridge top to the east is a gomba and cremation ground for both Buddhists and Christians lined with colorful flags. Being a majority of Tamang people it has beautiful Tamang culture show. escend to cross Adhi Khola on a box bridge and ascend to Shertung and Chalish villages, regally overlooking the fertile river valley and abundant fields. The name Shertung means ‘place of gold’. According to a legend, two brothers in search of gold were led here by a dream and thus the settlement was born. Tamang are rich in their own tradition to perform the visitors jhankri or shaman dance, ghode or horse dance, said to have been brought from Tibetan culture long ago. Jhankri (shaman) activity is robust in this territory with the worship of natural forces and indigenous local deities interwoven with Hindu and Buddhist practices. Holy Chyamra dandd, Fyanchyat monastery, and Sajyat are the best attraction here. Spectacular Mountain View of Lapsang Karpo, Ganesh Himal (Yangri) as well as Ganesh II and III can be seen from this village. Trek downhill walking to Chalish village taking 30 minutes’ walk, leave your most of the luggage and trek to Tatopani (hot springs) walking 1 ½ hours where pack lunch will be suited to eat (no lodge has built yet). Enjoy half of the day taking bath with one of the best hot spring of this region. After enjoying return back to Chalish (Gurung inhabitants) village. Roughly walking of 30 minutes, you will reach Mani Danda. This hill station offers an excellent view of Ganesh Himal ranges. Trek continued passing Deul danda, Gobre village (hilly walking slow walking is recommended with your guide and porter), Chhap danda and Bandari Bhir where rock climbing possibility has been seen. After lunch trek continues to Lishne jungle, cross a suspension bridge, passing through Chhapchyat village you finally get to Jharlang village (Ungul). One of the best and panoramic mountain View point of the area. This is Tamang village and belongs nearly 200 houses. First part of the trek, we walk roughly about 2 hours downhill to Jharlang Phedi passing paddy terraces with beautiful landscapes. Passing through suspension bridges of Ankhu khola and Chyamchyat as well as Ri village other side of the river finally reach at Darkha gaon. This village is mix culture village of Brahmin people and Tamang as well as Dalit. After breakfast trek all the way down to Darkha Phedi. Roughly about 45 minutes walking downhill there is a local jeep station where take a local jeep down to Dhading Bensi. During the drive, you can pass Kimdang phedi villages, Katunje village, and Jyamrung village. From Dhading change another bus and drive back to Kathmandu taking 3:30 hours as a maximum driving. How much does Ruby valley trekking cost? Hike to ruby valley combine with Pangsang Pass La pass trek is available now on USD 850 is standard trek price on double occupancy basis. In this price, we offer you Tourist Standard accommodation in Thamel, Kathmandu and of course the trip price will vary according to group size. For the deluxe and luxury trekking tour plan, we add 3-star category hotel deluxe air-conditioned room in Kathmandu (BB PLAN) and fully tented camping accommodation along the routes. AND WE ARE OPEN TO CUSTOMIZE YOUR TOUR AND PACKAGES PRICE AS PER YOUR REQUIREMENTS. International tour leaders are highly encouraged to get discount and attractive complimentary. 2 night’s twin sharing tourist standard accommodation in Kathmandu within breakfast plan. We can organize private Ruby valley trekking starting at any date that works for you. Please contact us for more information. Question: Do I need the experience to do Ruby valley trekking? Answer: It is suitable for keen trekkers/walkers who are able to walk around 4 or 5 hours in a day, with a lightweight daypack. For this trek, if you have about the little experience would be better. Question: What kind of accommodation can I expect on express Ruby valley trekking? Answer: We provide you tourist standard accommodation in Kathmandu and homestay accommodation along the routes. Rooms along the routes are clean with a cozy bed with a nice mattress and blankets. However we recommend you to take your own sleeping bags if you have one with you otherwise, you may rent it while you are in Kathmandu. Question: What opportunities will I have for a shower along Ruby valley trekking? Answer: Some of the local homestay they have a shower which you can get it on paying however if you are in camping trekking – we provide you hot water bucket then you will take a bucket shower. Question: How do I get drinking water on Ruby valley trekking? Answer: Normally you can buy bottled mineral water to drink in some places but we advise against buying mineral water in plastic bottles, as currently there are no provisions for disposing of these. Instead, we provide boiled water or bringing chlorine tablets to purify the normal water as the normal water is available in campsite/along the way. Question: Is there any communication facilities on Ruby valley trekking? Answer: Sometimes Yes! So buy a local SIM card to use telephone and internet services. Answer: No! So, far the trekking routes you need to have cash Nepali rupees because credit cards work only in the bigger city areas. Question: Who will carry my luggage on Ruby valley trekking? Question: Is ruby valley of Ganesh Himal trekking different than Ganga Jamuna trekking? Answer: No. Both trekking routes are same. Experience real Nepali hospitality, local culture and tradition and their life styles. The above itinerary is subject to change due to a condition beyond our control. This is a Guideline showing tentative camp night stops. A physical, technical and natural condition may change this above itineraries.